It was the day when I met Serge Lutens. That's a day to remember, such heavy stuff, like I had the best whiskey in my life. Literally. That was not perfume that I knew. Since then all of Serge Lutens perfumes feel for me like a good sip of old good aromatic pure whiskey. It's the taste (yes, I feel them in my mouth) and it's the faintly effect of the perfumes on my head, I'm a bit drunk. So I loved them and for days I visited the counter to try again and again all the export line and I loved all of them. Got my purse full of samples which I would use day and night in a thrill how I shall never feel before. Then was two months later when one day it was too much. 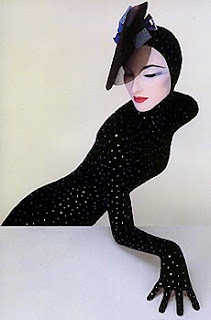 I was like now I know Serge Lutens and the tricks he plays on us. I understand his philosophy, got the idea. And somehow I felt cheated, it was like I understand that he tries to seduce us but he is not serious with us and we are just the fools (it was only me, but I took all of you in my rationales there). I was still new to perfumes at that time and still I am. But then I was a newborn. Even with that on my mind, Serge Lutens still let me charmed with himself as a person, who is the man behind this big show. And so I discovered on his site how you can get for free the wax samples of his exclusive Paris jars. And that was another day which I will always remember: Iris Silver Mist, Rahat Loukoum, Tubereuse Criminelle and all of them on and on again. And I was hooked again. And I dream of entering Palais de Shiseido and trying the juice from the wonderful bell jars that I see in pictures. Yeah, my dream. Now I'm back around SL counters. Try them again and again there and not use up my samples. Still a baby but with some basic understanding of complexity of his perfumes, I am back in to it. So why do we love Serge Lutens? What's so fascinating about his perfumes that we will name SL by the way in any talk about perfumes, lists of favourites, lists for seasons etc? Though we love so many other perfumes. My perfume gifts are always Serge Lutens. I spend considerable time trying to imagine what perfume would match what friend of mine. And then I hit them with a Serge Lutens perfume. Eventually they don't know SL and they are terrified. I like it. Yes, what's that stuff? But they will always have the bottle from me and most of them ended loving them. One of my friends, not so convinced about the perfume, discovered that her 5 years old son was telling her how nice she smells only when she wore SL. That was the prove for her (sorry, dear, to use your story here, but it's a lovely one). 1. SL are perfumes. Either you like them or not they are single, by themselves perfumes forever, what means a perfume with it's timeless beauty..
2. SL are each unique. At the beginning I thought many of them smell similar but I know now that only the initial olfactory shock is similar. I don't believe in the comments that that or that SL perfume is combination of others. 3. SL are ideas. You don't get only a perfume, you get something to reflect upon. All the way they last. A case of Platon? 4. SL are stories. They are dramatic. They start and grow and change and come back and surprise you and let you quite tired in the end. 5. SL may be addictive but you don't get accommodated with them. May be they suit you but you don't lost them on you. SL says that his perfumes should be worn as jewellery. They shouldn't be! They wear like jewellery, you can't get around them. 6. If you wear a SL you smell of SL and it's nothing else to be mistaken with. (oh, if you ever experienced a person in the crowd smelling of SL! It's gorgeous). 7. Any SL can make a signature smell. 8. SL perfumes respect me as a perfume user. No matter if I like them or not. They give me the best and don't fool around with me (tell me how often you feel that in front of endless shelves of mainstream perfume shops). I don't want to make a statue to Mister Serge Lutens. He probably doesn't even need MY statue. I just want to express the joy that such things exists. For me it's a joy to come around the SL place in any perfume shop. I'm writing this after the experience with the newcomer Fille en Aiguilles. Will I ever buy it? I would at any time. It would make a life of me and my perfume up to the end. I won't say here what is this perfume, I still need time to enjoy it and discover it. You can find good reviews here and here and here and many others. My problem is which of SL perfumes I want to be and end my life with it? It's easy to do it for others, I chose what SL perfume they are. But me? One day I want to be Bois de Viollete, other I want Rose de Nuit and quite often Daim Blond and Iris Silver Mist always. And any of them. But who will be finally me I didn't decide yet. And that makes me also happy, I can enjoy all of them. The only sad thing about SL is the way the export line is sold. In my town there are 3 perfume shops where you can buy them. And in none of them you find people to tell you what it is about. They try like always to sell you the latest addition, last year was Nuit de Cellophanes, now is Fille en Aiguilles. Lat year was even Feminite du Bois, I heard the lady saying proudly to a customer how that's the new SL perfume. I was upset, that's not the way SL should be sold. Sad! And last: it made me happy writing this. Could make no sense, but I feel better now. And with one of his perfumes on each of my wrists. Picture: SL make up. Don get it wrong, SL doesn't have faces for his perfumes, they can be for women or men, young and old, living or dead! I love this interview with Serge Lutens. Somehow I knew he is like that before reading it, his perfumes say it all.